My “river moment” is really a high speed compilation of millions of moments that span the last 28 years (and counting), and has very recently given me my own wonderful “Aha! moment”. My first river trip was at age 27 on the Lower Youghiogheny River in Ohiopyle, PA. I was with a group of friends and as we drove through this town of 60 residents and 1.5 million visitors/year, I was instantly intrigued and in love with the place. I even saw (did not meet, just saw) my future husband that day and proclaimed to everyone in the car that “I want to come back here and spend a lot of time here!” – they all absently agreed that I should do that on my own time. 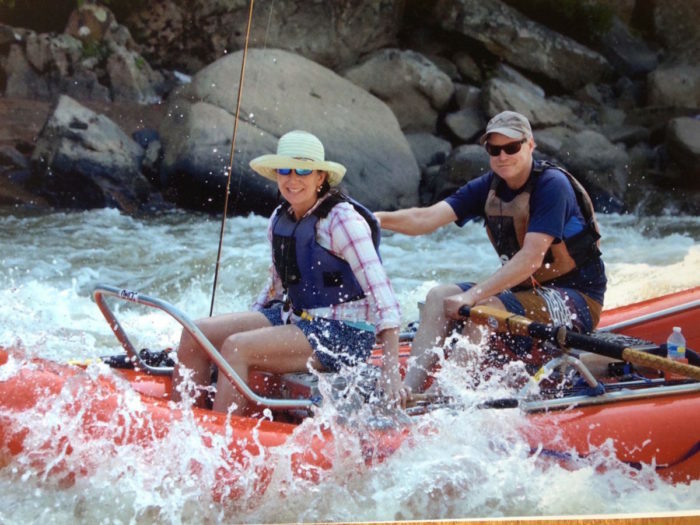 Fast forward 5 years – I married that ex-river guide, had 2 kids, and was living there! Over the next 22 years, Fred and I worked hard so we could play hard. We built our family’s lives around river trips & ski trips – every weekend we floated the Middle Yough (pronounced “Yock”) section once the kids could fit into a life jacket, and every long weekend we ran overnighters either in WV or on the Lower Yough. Several years we traveled across the country to float the Green River, as well as the Middle Fork of the Salmon. I feel very lucky to have a husband and two grown kids who, at the end of each ski season, still ask “When are we gonna run an overnighter? !” River running has given our family and friends the ability to stay close, overcome adversity and uncomfortable situations together (think pouring rain with rising water, blowing wind/sand, with no great shelter in sight, or running out of Go-gurts an Day 2 of a 4 day float), and learn to communicate and entertain ourselves and each other. Having Fred as a husband and father to my kids has been awesome – this man knows how to row through tight spots, low water, screaming tantrums, and he STILL has a smile on his face because he knows that we will remember these trips as the best experience, and always, that we will run “another trip of a lifetime”. In my experience, a river guide learns to stay calm and in control during tricky situations, knows how to read water, loves being outside, is always moving, always busy, tells great jokes, cooks in a dutch oven, and is happiest when we shove off shore at the put in. Our kids are now making their own way, and still using the river to stay connected with nature, friends, and family. As I was thinking about what to write, and trying to pick one great river moment out of literally millions, I suddenly realized – and actually said “AHA!” – that all you really need, whatever gender you are, is to either be a river guide, or marry one (or live with one, you get the idea).